Diego Costa has once again hit out at former Chelsea manager Antonio Contebecause of the way he dealt with the Spanish striker last summer. 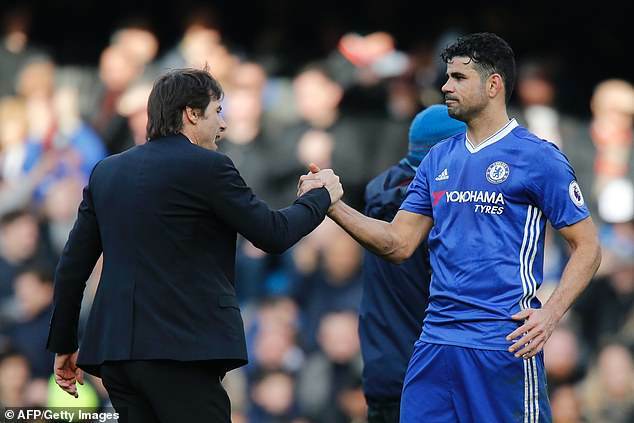 Costa went AWOL just months after Chelsea won the Premier League title in 2017 after a major row with the Italian manager and lost his place in the team as a consequence. The 29-year-old scored 52 goals across three Premier League campaigns at Stamford Bridge and was a part of two title-winning squads but was allegedly deemed surplus to requirements by the Italian. Speaking to Spanish outlet Marca Costa admits leaving Atletico initially was a mistake and he was far from pleased with how Chelsea dealt with his feud with Conte. ‘I don’t regret that experience as the Premier League is impressive,’ Costa said. ‘I wanted to play. Chelsea are also a big club. At that time, I needed to change. I’d done things very well and wanted to try something different. I was very happy at the club and with the fans, they had a great affection for me. ‘I’m always proud and that gives me confidence, I feel comfortable. I left, I won two Premier League titles… I already told him (Simeone) that he had to sign me to start winning things. He knows that I love him, and the group… almost all of them were still there. When I left, I was leaving some colleagues I’d known since I was 10. ‘It was a very bad moment but it wasn’t my fault. People said things, but time puts everything in its place. Look where the coach is, look at Conte. I was wrong going to Chelsea because of their way of dealing with things. Cholo [Simeone] is a direct coach, and when he doesn’t love you, it’s clear and he facilitates it. At Chelsea it was the opposite. He agreed a move back to Atletico in September 2017 but could not play for them until January because of the club’s embargo on registering new players. Costa helped Simeone’s side to win the Europa League last season on his return, scoring the only goal in the semi-final second leg victory over Arsenal. He has so far notched three goals in eight appearances this season as Atletico remain two points behind title rivals Barcelona and Real Madrid in La Liga.